Bearing Seals, also known as grease seals, are used to protect tapered, spherical, cylindrical and double-row bearings from excess grease loss and contamination. In 1956, Clark Seals partnered with The Timken Company to develop the industry’s first precision bearings seals for tapered roller bearings. 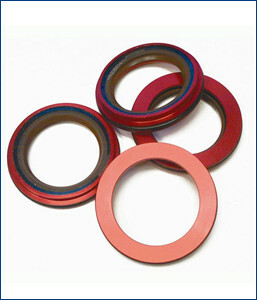 Over the years, Clark Seals has pioneered many significant advancements in bearing seal design and manufacturing technology, including the industry’s first sheave and excluder bearing seals, unitized zero-friction bearing seals, hand-install bearing seals and vacuum molding technology, a technology that revolutionized seal manufacturing.